Singer/songwriter Pete Seeger was the subject of a federal investigation after he expressed opposition to the internment of Japanese Americans during World War II, according to a 1,700-page FBI file released by the National Archives this past week under the Freedom of Information Act. Seeger, known for such songs as “If I Had a Hammer,” “Where Have All the Flowers Gone?” and “Turn! Turn! Turn!,” was suspected of divided loyalties because he was engaged to a Japanese American, Toshi Aline Ohta, and was a member of the Communist Party USA. The couple met in 1939, married in 1943 and were together for nearly 70 years. “We, who may have to give our lives in this great struggle — we’re fighting precisely to free the world of such Hitlerism, such narrow jingoism. The letter was forwarded from the American Legion to the FBI and then to the War Department, which began probing all aspects of his background — the leftist Almanac Singers, a group to which Seeger and his friend Woody Guthrie belonged; his association with folk legend Lead Belly; family members; former landlords; and even the grade school in Connecticut that he attended. The file showed that Seeger was interviewed at length about his affiliations by Special Operator Roderic Duchemin at Keesler Field in Mississippi. “Seeger stated that he is not married but that he is engaged to a New York girl whose mother was born in Virginia and whose father was born in Japan,” Duchemin wrote. “Concerning his fiancee, Subject stated that her father is a refugee from Japan and that he came to this country because he disagreed with the militarists of Japan and was consequently given the choice of remaining in Japan and being executed or leaving Japan and being allowed to live. Subject stated that the girl’s father chose the latter. “When questioned as to whether or not there is some sort of Japanese American organization in New York, Subject stated that such an organization does exist under the title of the Japanese American Committee for Democracy and that this organization has such sponsors as Pearl Buck and Albert Einstein. Subject stated that the State Department has taken quite an interest in the organization and has several times provided speakers for meetings held by the JACD. “This organization, according to Subject, was organized for the purpose of showing this country that the Japanese who were born here are one hundred percent American. Subject said that resolution had been passed by the organization in order to indicate the loyalty of the ‘Nisei’ to the U.S. Subject said that members of the JACD have assisted in combating the threat of the Black Dragon Society that has been active in the new settlements provided by the government for the Japanese who have been placed in them. “Concerning a resolution supposedly passed by an organization of the West Coast, Subject stated that he believed that a group called the ‘United Farmers’ or some such organization had passed a resolution to the effect that all Japanese be deported to Japan after the close of the war. However, Subject does not believe that the majority of people of the West Coast would want to see this happen. 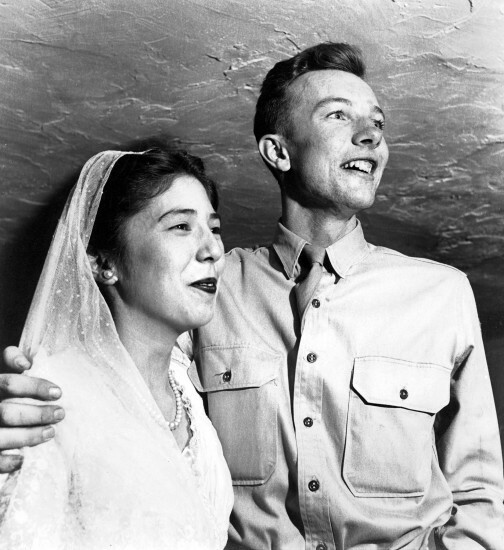 “Darling, you don’t know how sorry I am that the Japanese question has come up and is bothering you … not you personally, of course, but what you are doing in the Army. Frankly, I think that combination of Almanac’s etc. and me is going to keep you from going overseas. “Hope you didn’t say too much about Daddy’s banishment and the cause. Nowadays it is just as bad to be too progressive as it is to be a militarist. “Am enclosing the summaries of the Forum we had on Japanese Americans in the Victory program … at the Hotel Commodore. Thought you might be interested in how we are getting along. Seeger was allowed to entertain troops in the South Pacific and made corporal. In later years, he became involved in a variety of causes, including civil rights, the environment, the Vietnam War, and nuclear disarmament. Toshi Seeger, a filmmaker, producer and environmental activist in her own right, died in July 2013 at age 91. Pete Seeger died in January 2014 at age 94.